Hypoxia is a common feature of solid tumors. Up-regulation of hypoxia-inducing factor-1 (HIF-1) occurs in the majority of primary malignant tumors and in two-thirds of metastases, while most normal tissues are negative. HIF-1 induces the glycolytic phenotype, which creates an acidic extracellular microenvironment and associated pH gradient such that drugs that are weak acids are selectively taken up and retained in acidic tumors. 7-Butyl-10-amino-camptothecin (BACPT) is a prime example of an agent that can exploit the tumor pH gradient for enhanced selectivity. This study profiles the antitumor activity of BACPT in vitro and its water-soluble dipeptide ester, BACPTDP, in vivo. Antitumor activity was evaluated by proliferation assays in cancer cell lines and in murine xenograft models for human neuroblastoma (IMR-32), colon (HT29), ovarian (SK-OV-3), pancreatic (Panc-1), glioma (SF-295) and non-small-cell lung (NCI-H460) cancers. BACPT had superior antiproliferative activity compared to established drugs in monolayer cultures of human neuroblastoma and pancreatic tumor cell lines and in 3-dimensional histocultures of colon and primary ovarian cancer. Antitumor activity of BACPTDP was comparable to irinotecan in IMR-32, HT29, SF-295 and NCI-H460 xenografts, significantly greater in SK-OV-3 and in Panc-1 where complete regressions were observed. 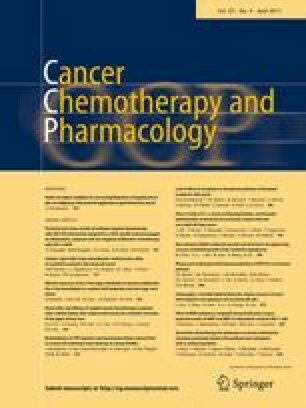 Combination of BACPT with gemcitabine produced additive to synergistic interactions in Panc-1 cells that were independent of drug ratio and optimal when gemcitabine was administered 24 h prior to BACPT. BACPTDP is a water-soluble camptothecin pro-drug that spontaneously generates the lipid-soluble active agent, BACPT. This topoisomerase inhibitor exploits solid tumor physiology for improved selectivity and activity against multiple tumor types with particular promise for use in treating pediatric neuroblastoma and pancreatic carcinoma. This work was supported in part by Small Business Innovation Research grant CA125871 from the National Cancer Institute.